Every franchise has it. The ugly duckling. The movie that doesn't quite live up to the franchise. It's not surprising that more often than not, that movie is the third instalment. They tend to feel unnecessary; tacked on. An afterthought designed simply to cash in. Mad Max Beyond Thunderdome kind of feels like that movie. But it's not. Beyond Thunderdome isn't what fans expected after the success of The Road Warrior (review) but just because it's a lesser movie doesn't mean it's not essential to the franchise. It's simply an unexpected entry that doesn't quite mimic the others. While the previous instalments focused on Max Rockatansky and his quest for either revenge or rescue, the third movie seems more bent on expanding the world that Max survives in and exploring just how far humanity has fallen. The roving gangs which peppered the desert in previous instalments seem to have disappeared and instead, we have an apparently far more civilized way of survival which in reality, is less dangerous for the every man but also more violent. And led by a woman. For a girl of 15 in love with everything that had a whiff of anti-establishment, Tina Turner's Aunty was the second best thing ever (second only to Ripley). Not only is she the leader of this violent new city, she rules said city with an iron fist and she does whatever she deems necessary to keep her power. She's so good at what she does she even manages to use Max for her own devices. It's the first time we see our warrior hero reduced to lackie and well into the final act, Aunty is playing the unfolding events to her own wants and needs. She is, quite simply, awesome. In it's second half, Beyond Thunderdome is a beast that seems totally out of place with the rest of the franchise. Rescued by a tribe of children, Max finds himself in a near paradise completely devoid of anyone over the age of 20. It's certainly a bizarre tonal change but also a fascinating look at how children have managed to survive the apocalypse - seemingly much better than adults. I've since come to think that Miller and co-writer Terry Hayes are commenting on how the future belongs to the young. The Mad Max saga chronicles the trials of a moral man surviving in a deprived, amoral society. It's a warning of how far society will fall in the face of near total destruction and how, from that destruction, a new society will rise, one in which the children will carry the flame. I love that the final moments of Beyond Thunderdome give us a glimpse of the good that comes from the bad and that Max is forever remembered as a saviour, a man who wonders the desert landscape rescuing those in need. The ultimate hero. Even with that near fairy tale ending, Beyond Thunderdome manages to make room for the franchise's expected third act 20 minute chase sequence through the desert. This one isn't quite as furious and heart pounding as previous instalments, likely because it feels like a near duplicate of the tanker sequence in The Road Warrior and partly because the train aspect, though interesting, does limit the scope of the action. It's still an impressive feat but it doesn't quite have the adrenaline factor the previous instalments are well known for. 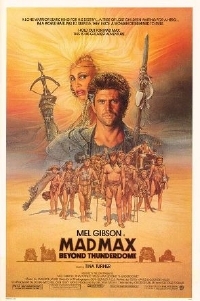 It's not the movie fans wanted and yes, it's definitely the weakest of the trilogy but Beyond Thunderdome isn't without merit and frankly, I've always loved that a franchise which depicted the future as a hellish place to live ended on an optimistic note; even if I can't wrap my brain around Aunty's high-heels in the desert. Really. WTF? I re-watched it recently. I liked it then and, still like it now.